This anime takes the maxim of "show don't tell" deeply to heart; it does a fantastic job of revealing characters through their words and deeds, not through exposition. Even though Shoutarou narrates things off and on, he's not given a bunch of overbearing information to bury us with (yes, that's a lame death/bone-related pun). He is discovering as we are, and that's what makes this story so fun to experience. The character designs are fetching, as is the visual artistry on display, very nicely done. Must admit I'm more than a little charmed, as a long-time tsundere enthusiast, by the depth and breadth of character we've been given with Sakurako. In addition to her obvious brilliance and beauty, she possesses so many layers and levels and lovely flaws. It's not often I come across a woman in an anime that seems so well-rounded and "possible". The relationship between Shoutarou and Sakurako is simultaneously simple and complex, depending on how you want to interpret it and what particular moment you'd care to examine. Their partnership is shown to have a delicious multitude of layers and to be continuously shifting and growing through new iterations as their shared experiences take them farther down their chosen path. I still don't know exactly who they are to each other, and what's great about it is that I get the strong impression that neither of them are quite sure, either. Just a tight, well-told series, with top shelf character development, imho. Basically everything this anime is about it put in my title for this review. As someone who is interested in things like science and forensics... this anime was incredibly interesting and captivating for me. The MCs tend to get caught up in investigations that require a lot of forensic science... things that tend to involve death, usually murder. The art style is just the right amount of creepy to really give this anime depth, beyond just being an interesting story. Everything was put together beautifully. I cannot recommend this to everyone, just because the topics of death and murder can be sensitive... but if that does not bother you, this anime is worth checking out. This show about a beautiful osteologist (someone who studies bones) is really smartly done. The characters are all interesting enough that the formula of "bones discovered, followed by an investigation" doesn't really get too old. Animation and sound are solid, if your looking for a non-fantastical anime, this one should be high up on your list. I absolutely love this series. This is a definite must watch if you're into murder investigations!! The main characters are both very likable and both develop appropriately throughout the series. I highly recommend this series if you liked Erased or Death Note. #143. Mysteries of the bone. 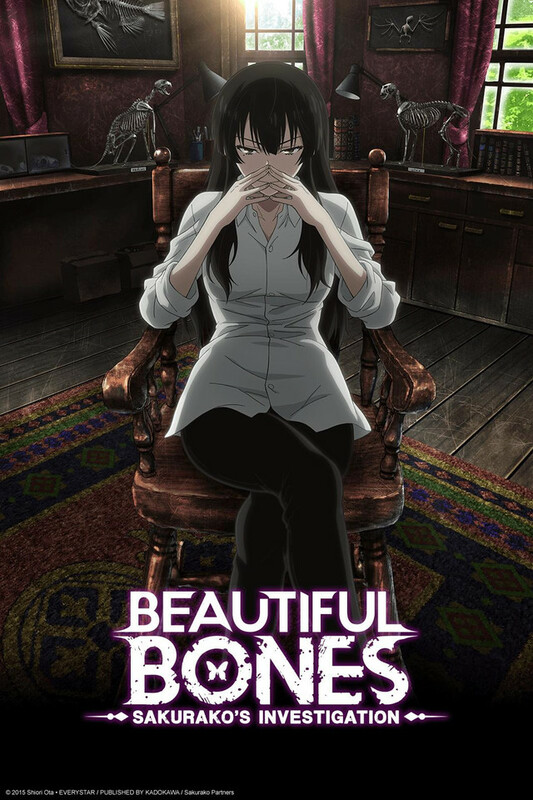 Beautiful Bones -Sakurako's Investigation- is a true mystery anime, I say true cause most anime that I have seen involving mystery are usually also comedic or supernatural. This anime however is purely focused on finding answers to those difficult questions, through the use of osteology. Sakurako Kujou, while not really a officer or investigator, is the local osteologist with an eccentric personality. She is frequently accompanied by her "assistant" Shoutarou Tatewaki, a high school boy who happened to get wrapped up in her obsession of studying bones. Together they have pretty interesting conversations on their separate views of the investigations they take upon themselves, working together to find out the cause of death, and giving the right information to the authorities. It is a solid mystery anime that left me satisfied by the end, but don't expect this anime to have dangerous antagonists and criminals around every corner. It is a mystery anime through and through, I say it's quite fascinating, and is worth the watch if your into mystery as a genre. It's a pretty good intellectual Anime. No fan service at all, smart dialogue, has suspense - not easy to predict the ending. This is a great anime with wonderful visual effects, excellent story telling and characters that are unique and engaging. The female lead is a genius and process of which she solves the cases are visually stunning. Of all the amine I've watched recently I think this is one that deserves a full length movie the most. This was a refreshing anime to watch. It was dark, creepy, and very well done. Sakurako was an interesting new character type for me. She wasn't good. She wasn't evil. She was balanced. She always see the world as it is. No-nonsense. I don't think we've seen all she has to offer yet. I really hope they release a season 2, because I would love to see even more of her character development. Murder She Wrote, but with taxidermy?